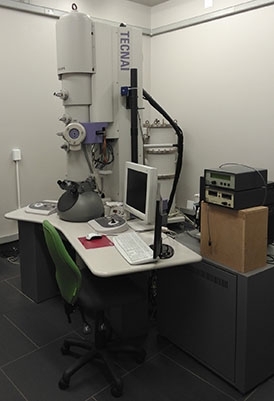 The Unit has two transmission electron microscopes available for staff and student use: The FEI F20 CRYO FEGTEM, and the FEI T20 TEM. The instruments can be booked in advance for as long as is required for a particular experiment subject to user demand at that particular time. The Unit offers training in the operation of these instruments. At present the demand for the use for the use of the TEMs is such that new users are usually instructed individually by their supervisors or by Mohamed Jaffer (who is the EM Officer responsible for TEM applications). If there is demand for it we will certainly develop a systematic course covering various aspects of TEM - It would certainly be beneficial to the graduate students who often leave with very limited insights into the technology that they spend most of their time using. Please e-mail us at trevor.sewell@uct.ac.za or send us an enquiry through our online enquiry form. if you would like such a course to be run and also what specific topics you would like covered. In 2007, the Unit took delivery of the FEI Tecnai F20 field emission cryo-TEM – the first instrument in this class in Africa. This instrument enables the determination of the three-dimensional structures of biological objects, including viruses and protein complexes at high resolution. In 2010, the Unit took delivery of a new FEI/Tecnai T20 TEM with a high resolution camera and EELS system.